. . . that I've ever seen (not in captivity). Charming. What a super shot - I love the repetition in the image, the focus and the way the second one is lookimg right atyou with a shocked expression! So much fun. What a great shot ... they look so suprised to see you .. love the soft background .. Beautifully captured, where was this taken? Such a beautiful capture. Love the composition, too. OMG how fabulous to see these beauties in the wild and even better to get a wonderful shot of them! I have never seen owls outside a zoo so am very jealous! Gorgeous! Cool! I still haven't seen one not in captivity... some day. Wow, nice focus on these lovely creatures. What an incredible capture. Love it! Amazing...like they posed just for you. Fantastic! They look like statues. Really amazing capture! This is soooo cool!!!! Having the double makes it really pop! and two together. that must be unsusual. How wonderful to get this shot with both looking towards you. 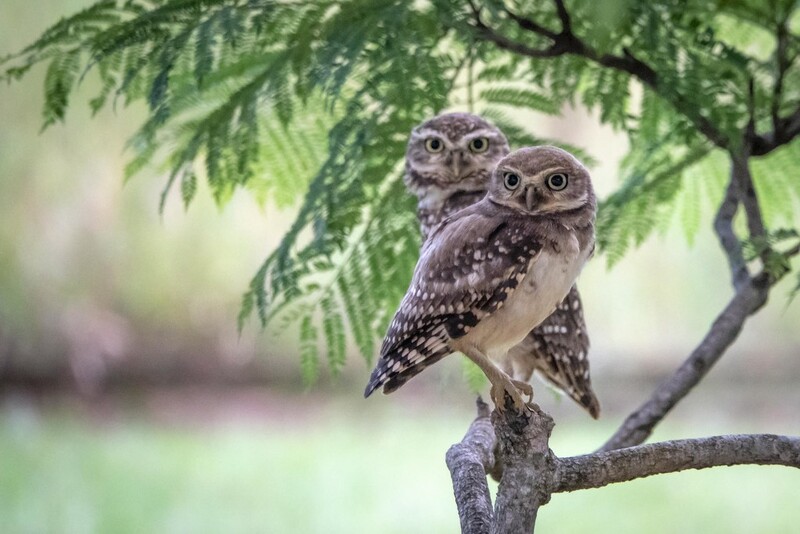 Sweet little owls! So nice that they cooperated! Lucky you to see them! Fabulous capture.